Velux loft conversions, named after its window brand name, are built within a roof with sloping windows facing skywards, with the windows fitting into the line of the roof. As the UK’s market leader, Velux loft conversions are striking, attractive and are a popular choice. They’re straightforward to design and build and have excellent noise-reducing capabilities. A Velux loft conversion involves no external alterations and planning permission is on the whole, not required. 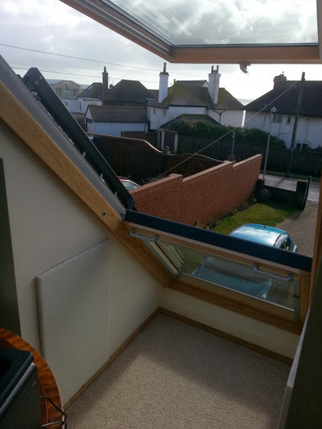 You’ll need reasonable headroom in your loft – 3 metres and over – and I’ll be happy to guide and advise you on every aspect of your conversion. The Velux company offers a wide range of windows and blinds to suit all needs and budgets; in fact, the choice is sometimes overwhelming, so let me guide you on how to make the most of your space and to capitalise on natural light. As a reputable builder with over 30 years’ experience, I value safety above all else. 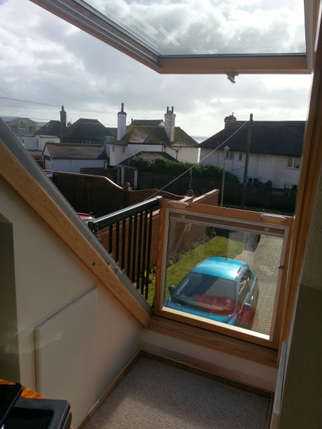 Current building regulations mean that each converted loft must meet emergency and access requirements. 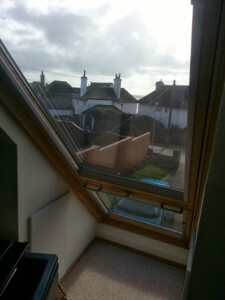 With a Velux loft conversion, installing a roof light that’s also escape window is simple and gives you peace of mind. Did you know that a Velux loft conversion can save the environment and your hard-earned cash? Velux windows deliver excellent thermal efficiency: a standard glass panel reflects inwards 60% of the heat in the winter and 60% outwards in the summer, thereby reducing your energy bills. And, saving the planet of course. Interested and keen to learn more? Is your loft suitable for a Velux conversion? There really is only one way to find out so give us a call to find out more and start looking forward to your new, usable space today. Follow Hugh’s board Velux Solar on Pinterest. Follow Hugh’s board Roof Terraces on Pinterest. Follow Hugh’s board Velux Blinds on Pinterest. Follow Hugh’s board Velux Ventilation Windows on Pinterest. Follow Hugh’s board Velux Center Pivot on Pinterest. Follow Hugh’s board Velux Top Hung on Pinterest. Follow Hugh’s board Flat Roof Windows on Pinterest. Velux Windows are the largest manufacturer and supplier of roof windows on the planet and their products have become an integral feature in all types of loft conversions. 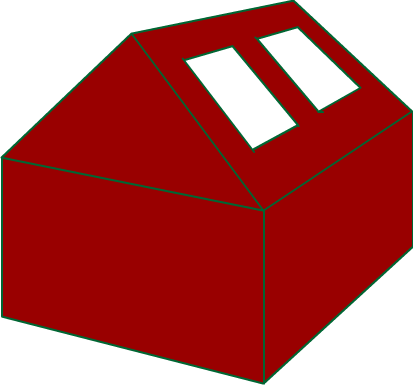 Indeed their trade name has become the name of a type of loft conversion in it own right, The Velux Loft Conversion. The installation of such windows will provide the loft space with substantial light. A Velux Loft Conversion will sometimes not require planning permission, although they will always require UK building regulation approval.